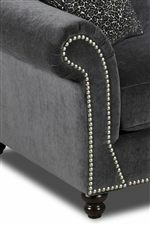 Create a luxurious living room ensemble with this elegant chaise lounge. 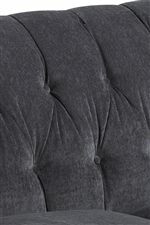 The traditional button tufted back cushion creates a sophisticated look, with a down-blend seat cushion that really lets you sink in a relax. Rolled arms with nail head trim accents complete this timeless look. The Flynn Traditional Chaise with Button Tufted Back, Rolled Arms and Throw Pillow by Klaussner at Al-Mart Furniture in the Oak Park, River Forest, Chicago, Elmwood Park, Forest Park, River Grove, Maywood, Melrose Park, Berwyn, Cicero, North Riverside, Brookfield, Lagrange Park, Franklin Park, Norridge, Oakbrook, Elmhurst, Bensenville, Lyons, Stickney, Harwood Heights, IL area. Product availability may vary. Contact us for the most current availability on this product. Arm Rolled arm with nail head trim. Nail head available in Old Gold or Pewter finish. Arms padded with foam or white polyester cotton. Contour of arm formed with edge roll. The Flynn collection offers regal traditional style for your living room. These high quality upholstered pieces are made in America, and are constructed to hold up to your busy lifestyle. 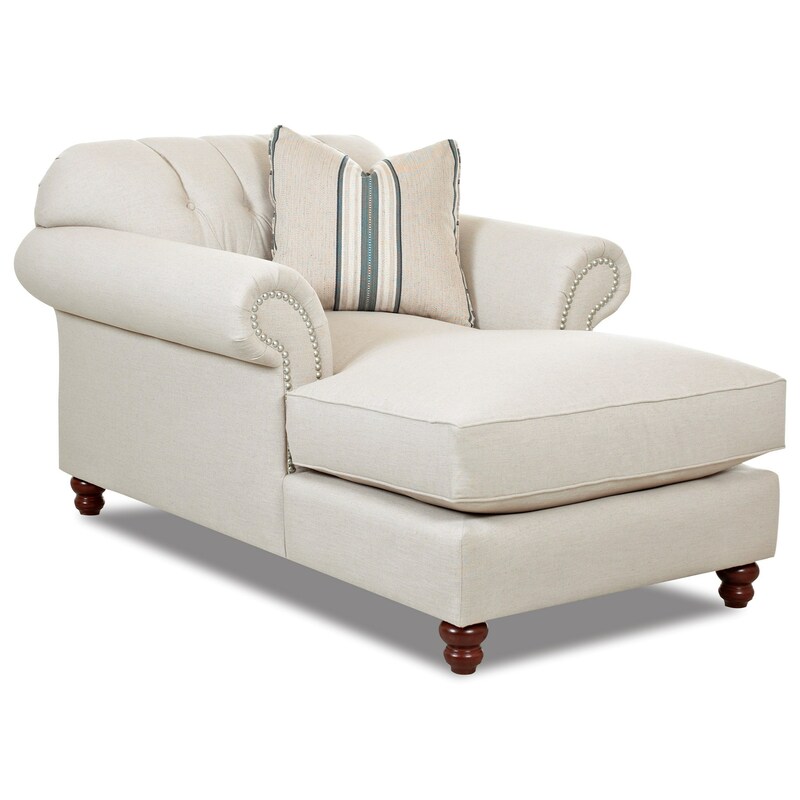 Both comfortable and stylish, these pieces feature traditional design details such as button tufted cushions, nail head trim accents, and turned wood feet. The Flynn collection is a great option if you are looking for Traditional furniture in the Oak Park, River Forest, Chicago, Elmwood Park, Forest Park, River Grove, Maywood, Melrose Park, Berwyn, Cicero, North Riverside, Brookfield, Lagrange Park, Franklin Park, Norridge, Oakbrook, Elmhurst, Bensenville, Lyons, Stickney, Harwood Heights, IL area. Browse other items in the Flynn collection from Al-Mart Furniture in the Oak Park, River Forest, Chicago, Elmwood Park, Forest Park, River Grove, Maywood, Melrose Park, Berwyn, Cicero, North Riverside, Brookfield, Lagrange Park, Franklin Park, Norridge, Oakbrook, Elmhurst, Bensenville, Lyons, Stickney, Harwood Heights, IL area.